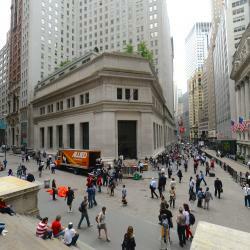 What Do Elections, ETFs, World Cup & Google Have In Common? Google is celebrating the commencement of the World Cup in Brazil with its animated doodle. 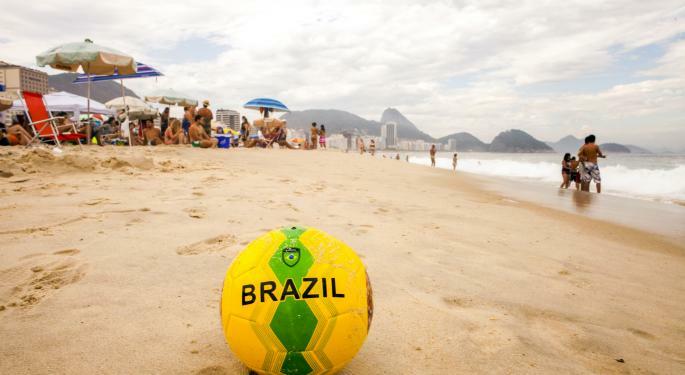 Amid hosting the World Cup and the country's upcoming presidential election in October, Brazil ETFs are following a goal scoring trajectory. On Thursday a Green and Yellow football, representing the colors of the Brazilian Flag, opened the Google Doodle animation of cheering fans surrounded by the country's famous landmarks. Friday's doodle continues to reflect the festive spirit surrounding the 2014 World Cup with the letters "l" and "e" dancing and drumming. The letters continue to cheer on teams dribbling the ball and cheering in the stands. The first game featured Brazil and Croatia at the Arena Corinthians in Sao Paulo. Brazil beat Croatia 3 to 1. On Friday, Spain saw a disappointing defeat by the Netherlands, 1 to 5. Over the weekend, Italy won the match against England, France crushed Honduras, and Argentina beat Bosnia and Herzegovina. On Monday, Germany will face Portugal, Iran will take on Nigeria, and Ghana will play against the USA. A list of the matches and final scores can be accessed on the Fifa.com site. The presidential election for Brazil is on October 5, with runoffs scheduled for October 26 if needed. According to the Superior Electoral Court, elections "Are carried out together the federal elections and the state elections, for president and vice president, senator and alternates, governor and vice governor, federal deputies and state deputies. Two years later, will be municipal elections, of mayor and vice mayor and city councils. Note that the distinguishing criterion is by federal level and not by powers – the representatives from the executive and legislative are elected at the same time." Parties must elect candidates by June 30, 2014. The country's Democratic Labor Party voted to back President Dilma Rousseff's reelection bid, despite her changing her political party to the Workers' Party. The Workers' Party will announce Rousseff as its candidate during the party's primary convention in the capital on June 21. The current Vice President, Michel Temer, is part of the Brazilian Democratic Movement Party, which had voted 59 to 41 to back Rousseff and Temer. The Social Democratic Party and Socialist Party are expected to name Senator Aecio Neves and Eduardo Campos, respectively, as their presidential candidates. Following statistics showing that support for Dilma Rousseff has fallen from 37 percent to 34 percent, investors and the general public are optimistic on the change in leadership for the economy. iShares MSCI Brazil ETF (NYSE: EWZ) has trended higher on the statistics showing that Rousseff could fail, as Brazil is currently experiencing slow growth and high inflation. EWZ reacts to domestic growth gains as it has 30 percent of its investments in financials and 16 percent in consumer staples. 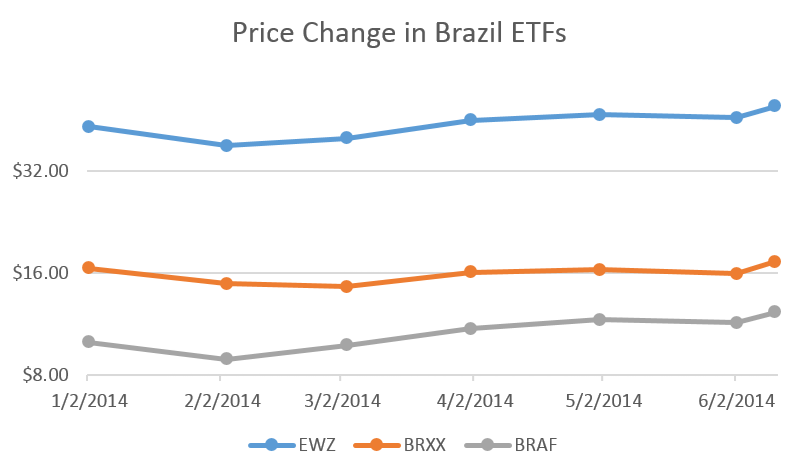 EGShares Brazil Infrastructure ETF (NYSE: BRXX) has recently peaked to its highest levels of 2014. Shares have gained more than 20 percent since March. 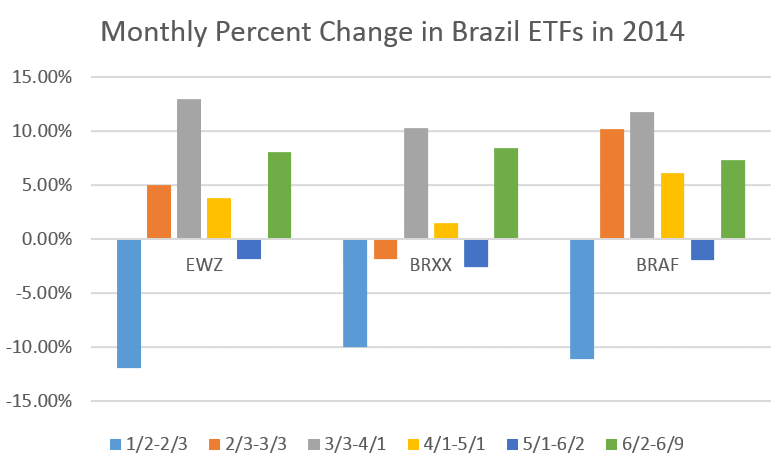 Investors believe the ETF that stands to gain the most from Brazil's change in leadership could be Global X Brazil Financials ETF (NYSE: BRAF). 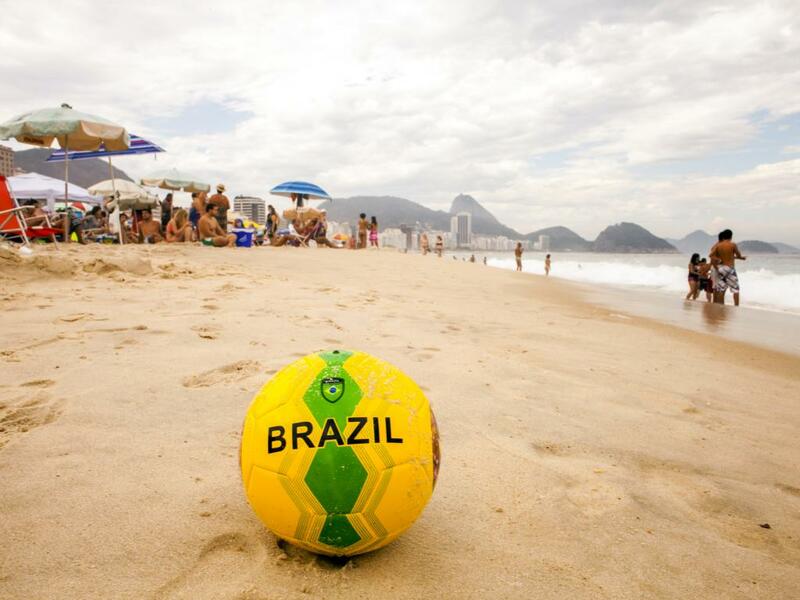 Global X Brazil Financials is composed of 28 stocks from the financial sector. Some investors may note the high risk associated with the reward, as the ETF is not highly diverse and trades a couple thousand shares per day. Editor's note: This is an updated story that was originally published on June 13, 2014.